Have you made a New Year's resolution? So many of my friends don't bother, but I always do. Some have been really good for me. I enjoyed Avery's post about simplifying her life this year. I don't need to simplify, but I'm going to manage my time better. (Did you like the way I cut "try to" from that sentence and was firm about my intention?) Of course, there's also that pesky resolution that rolls around every year about losing weight . . .
We're making a few changes here at Mystery Lover's Kitchen, too. One of our members will be leaving us, and we'll miss her terribly. I'm not going to tell you who, though. I'll let her do that in her final post this week. She promises to come back frequently as a guest, and we're going to hold her to that! Many of you have asked where Mary Jane has gone. I'm sorry to say that her husband suffered a trauma during surgery. His recovery is astounding his doctors, but not his family, who knew his strength and stamina. We look forward to Mary Jane's return. Sheila will continue to fill in for her until then. 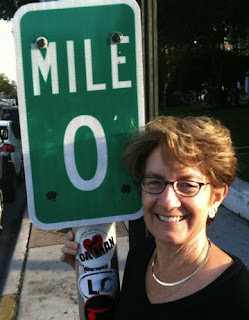 Lucy Burdette at Mile Marker Zero! But we have good news, too. Two new bloggers will be joining us! Lucy Burdette and Peg Cochran will be regulars here. 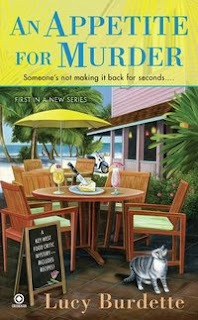 Lucy's new series about a food critic in Key West launches tomorrow! What timing! Key West is wonderful year 'round, but who doesn't want to be there right now? Perfect for snuggling up by the fire in icy weather. Peg's series won't debut until summer. One is about a woman who makes gourmet diet food! I can't wait to try some of those recipes. But we won't restrict her to low cal recipes, because I happen to know she has some wonderful recipes that might not be totally slimming. 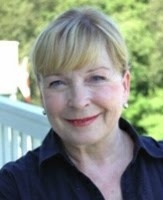 Peg will also be writing the Sweet Nothings Vintage Lingerie series as Meg London! So, starting next week, look for a slightly different line-up around here. I'm kicking off the year with a recipe from America's Test Kitchen. 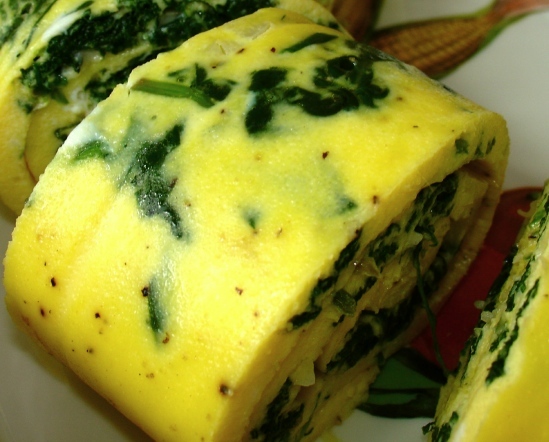 As soon as I saw this recipe for something akin to a baked omelet, I had to try it. I switched up the ingredients a little bit to suit me, but it's the sort of dish that can be tweaked to suit the preferences of your family and friends. It's absolutely delicious, and while it looks like it uses a huge amount of eggs, it serves six people easily. All those egg whites make it wonderfully light. I used a sharp white cheddar cheese, but it would have been just as good with a hard white goat cheese, or perhaps an Asiago. The original recipe calls for Gruyere. I also added garlic powder for a little extra garlic flavor, and a doubled the salt and pepper. This recipe has several steps to it, but once you've made it, it's the sort of thing that doesn't require a lot of precise measurements and can be made without referring to the recipe. Preheat oven to 375. Lightly oil an 18 x 13 rimmed baking sheet, spread with parchment paper, and lightly oil the paper as well. Cook the baby spinach leaves with the water. The recipe suggest doing this in the microwave, but a pot on the stove would work just as well. Pour the spinach into a sieve and press out excess water. Whisk milk and flour together. In a large bowl, whisk together the egg whites with the whole eggs, garlic, salt, and pepper. Whisk in the milk and flour mixture. 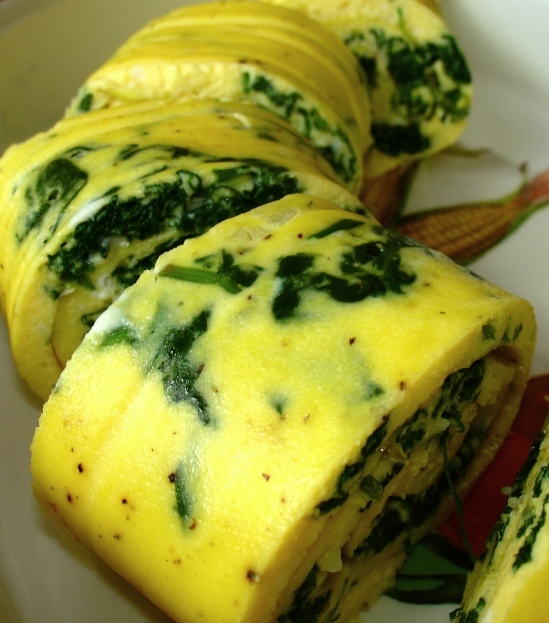 Pour into the prepared pan, top with spinach and grated cheese, and bake 11 minutes, until the eggs are just set, turning the pan halfway through. Please remember to vote for your favorite Christmas cookie recipe in the right sidebar! 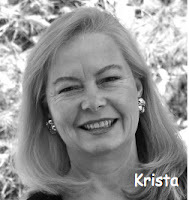 Krista - Thank you so much for bringing us all up to date! Love and prayers to Mary Jane for her husband's continued recovery, and a big, warm welcome to Lucy and Peg. Your recipe today is gorgeous. What an impressive brunch to serve family or guests (or self)! I'm drinking my morning coffee now, and I wish I could slice my fork right into your photo. I like the fact that this is made in the oven. The parchment should make rolling an easy prospect, too. Thanks for a sharing this, and I hope you have a great first week of 2012! This recipe sounds so delicious and is so pretty, too; I can't wait to try it. I found this blog late last year - just in time for some absolutely wonderful recipes. I learned about Penzey's Spices (bought and tried) and found that they have a store in traveling distance! Also found some new to me authors to follow. Thank you. 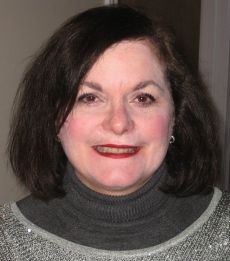 I'm looking forward to 2012 in the Mystery Lovers' Kitchen - Happy New Year!!! Thanks, Cleo! I wish you and your husband a healthy and happy New Year. Thank goodness Mary Jane's husband is on the mend! We loved this roulade. It's so light! The eggs are just delicious. I hope you'll enjoy it, too. Welcome to Peg and Lucy. Can't wait to see what you have cooking in your kitchens. And wait to read your books, too. Mary Jane, as you know, we are all pulling for a speedier than expected recovery. Hang in there, sweet friend! Here's to a fabulous new year and simplifying, managing time, or whatever your resolution is (or isn't). Hugs to MJ and hopes that everyone has a happy 2012! 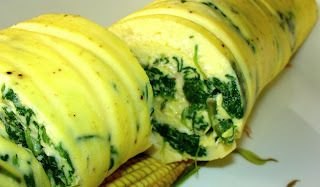 I always love those turkey and ham roll-ups and this looks like a delicious new take on a favorite, Krista. Yum! Welcome Lucy and Peg. Looking forward to exciting new recipes to add to my collection. 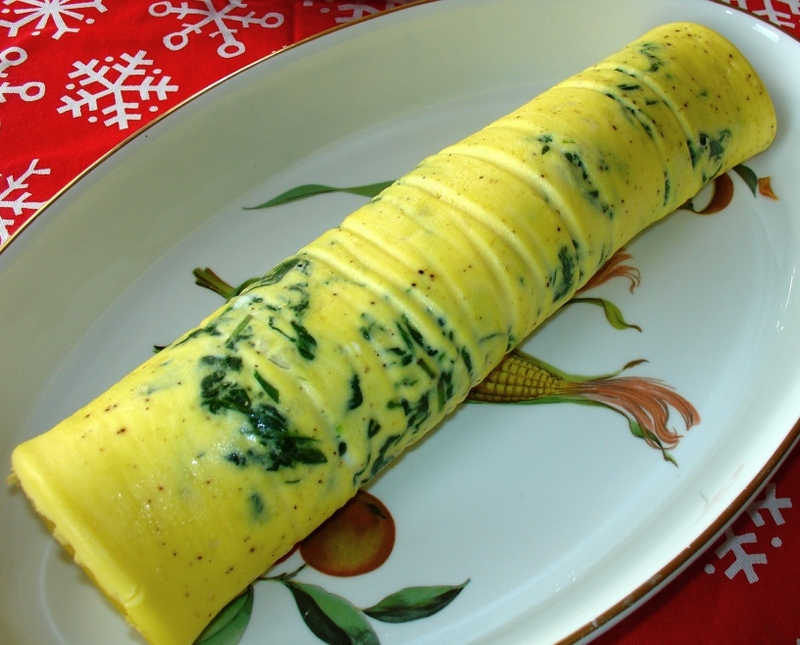 Wow the egg roulade looks delicious! I'll definitely try it, I think eggs and spinach are perfect partners like chocolate and peanut butter! Thanks for sharing!